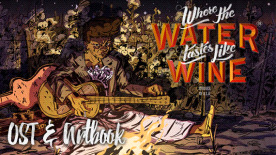 The full Where The Water Tastes Like Wine Original Soundtrack includes 29 hauntingly beautiful tracks arranged by celebrated composer Ryan Ike, and includes performances from a collection of talented musicians. All tracks are provided as High Quality MP3 and FLAC files. As a bonus, those who buy the Soundtrack will also get a comprehensive Digital Artbook from the game with their purchase. Soulsucker Blues: Althea sold her soul to the devil for fame and talent. She got both, but wasn’t ready for what it cost her. Featuring Akenya on vocals and Joshua Du Chene on guitar. Breathe the Black: Little Ben already had a hard life as a union man trying to get by in the mines. But things got harder when the Company sent their hired guns in to put things back the way they were. Featuring Joshua Du Chene on guitar. Vagrant Song (Deep South): Easy to get lost in the swamps and bayous of this land. Most folk like it that way. Featuring Joshua Du Chene on guitar and vocals. Miles of Smiles: Life on the rails might sound glamorous to some, but Franklin knew that only held true if you were the one holding the ticket. Featuring Ryan Ike on piano. Curandera: Fidelina practices the Old Ways. The Old Ways bring succor, peace, safety. But when the Old Ways fade to nothing, where, then, are we to turn? Featuring Cody Richards on flute and Joshua Du Chene on guitar. From This Field I Wish To Rise: Shaw’s family suffered beneath the yoke of slavery. Now, as a free man, not much has changed. Featuring Joshua Du Chene on guitar. Shining Isles of Ivory: August made a life on the high seas, but that life was lost to him. Now, trapped on the land he once cast off from, he’s drowning. Noodle It Out: If beauty and heartbreak are the stuff of poetry, Cassidy figured the open road was as much a poet as he was. Featuring Ryan Ike on piano. Dust to Dust: They say the heavy winds in the Dustbowl left nothing but stones behind, and stone is what Bertha became. She would not be moved. This Trench Was Dug For Me: Mason may have lost a leg to the war, but his marching days are far from over. Vagrant Song (Midwest): The cold outside just means a warm hearth burns all the brighter. Featuring Elizabeth Zharoff on vocals. Read ‘Em and Weep: No better allegory for American Life than rolling the dice on a big gamble. Everyone’s luck runs out, sooner or later. Featuring John Robert Matz on trumpet and Kristin Naigus on oboe. Tear It Down: It’s a hard time for a man of faith when there’s not much left to believe in. But then, isn’t that what faith is all about? Featuring Akenya on vocals and Ryan Ike on organ and piano. Vagrant Song (Southwest): Some of the best stories are those that have crossed borders. Plenty to be had here. Featuring May Claire La Plante and Jose Daniel Ruiz on vocals and Joshua Du Chene on guitar. The Road Remembers: The Long Walk took a lot of things from a lot of people. Tracing it back home might be the only way to heal. Featuring Michael Begay on flute. White Rider: The Old West is dying. Might not be long until the Rider comes calling. Featuring Joshua Du Chene on guitar and vocals. Root and Rise: Dig your fingers into the soil, help something grow. This land is part of you now. Featuring Joshua Du Chene on guitar and hand drum and Cody Richards on Flute. Vagrant Song (Northwest): You can’t tell someone when they’ve found prsoperity. They gotta decide that for themselves. Featuring ViderI String Quartet: Lizzie Jones and Michael Hustedde on violin, Roselie Samter on viola, and Jeremiah Barcus on cello. Howl: This land will swallow you whole, one way or another. Featuring Jeff Ball on fiddle and Joshua Du Chene on guitar. Heavy Hands: This land is build on stories. It’s one big story, America is, woven of many small ones. Featuring Max Wolpert and Jeff Ball on fiddle, May Claire La Plante and Joshua Du Chene on vocals, and Joshua Du Chene on guitar.